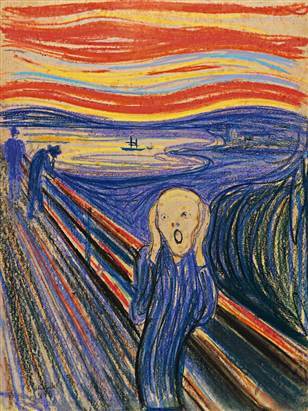 On May 2nd, the last privately owned of Edvard Munch’s four versions of The Scream will go up for auction. The head of Sotheby’s Impressionist & Modern Art department, Simon Shaw, says this colorful pastel is “one of the most important works of art in private hands. Given how rarely true icons come to the market it is difficult to predict The Scream’s value,” although he went on to say that Sotheby’s believes the price will exceed $80 million. 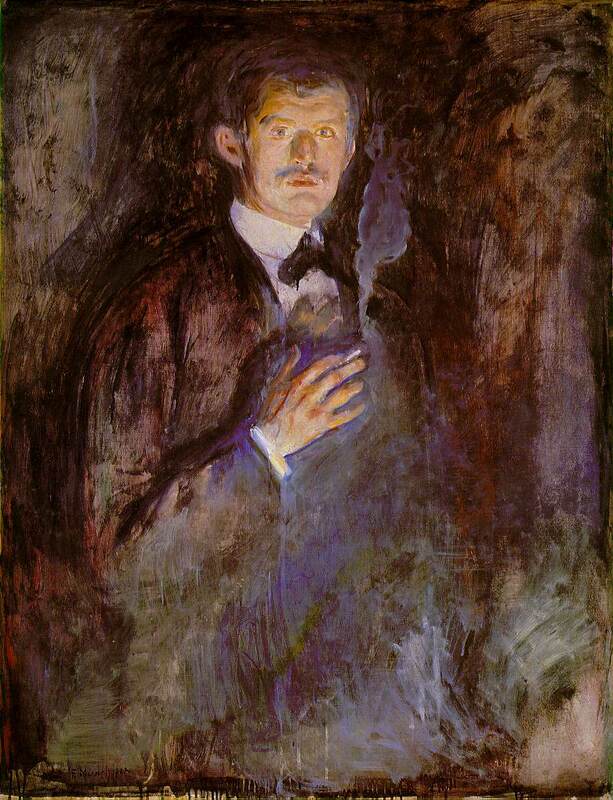 Symbolist painting attempts to capture an emotion rather than reality. 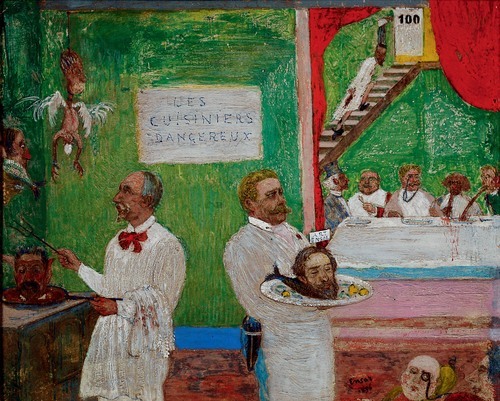 “Reason is the enemy of art,” James Ensor says, “artists dominated by reason lose all feeling” (Theories of Modern Art). He believes that Impressionists did not understand vision, while Pointillists were cold and methodical. Like The Scream, The Dead Mother captures denial and confusion. 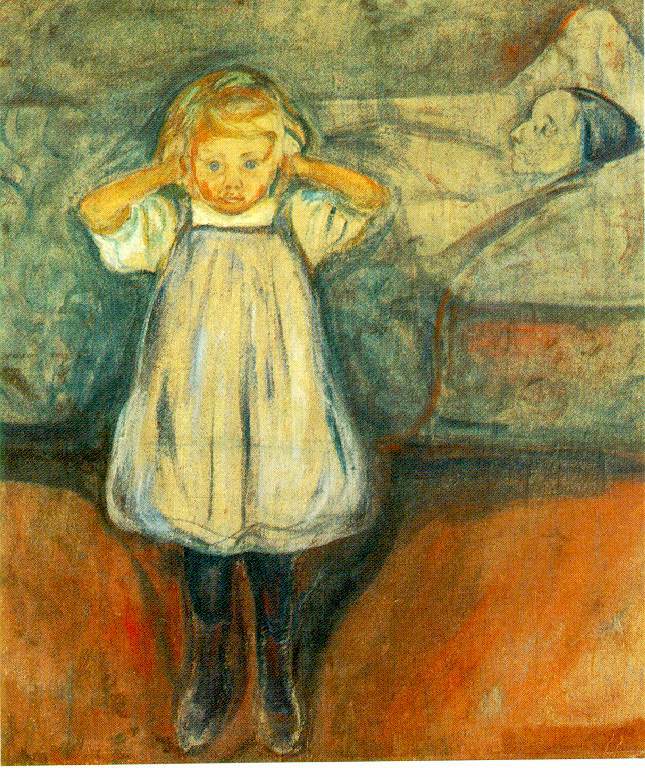 The child stands with her back to her mother and covers her ears in disbelief—she can neither see the body nor be told the reality of her mother’s death. Paint swirls around her, furthering the image of her self-exclusion. Her own skin tone is warm and she stands on warm, living orange tones, while deathly blues take over the rest of the painting and reach for her feet. She portrays the emotional rejection to death and change. This girl is certainly not acting on reason, but pure emotion. “The Symbolist viewpoint asks us to consider the work of art as an equivalent of a sensation received; thus nature can be, for the artist, only a state of his own subjectivity” (Theories of Modern Art). The Dead Mother effectively draws the viewer in to partake in the girl’s reaction of confusion, denial, and the struggle between life and death. 27 Feb	This entry was published on February 27, 2012 at 8:51 am. It’s filed under Art, Art History and tagged change, confusion, death, Edvard Munch, emotion, feeling, James Ensor, reason, Self portrait, Sotheby's, Symbolism, The Dead Mother, The Scream. Bookmark the permalink. Follow any comments here with the RSS feed for this post.